This topic contains 16 replies, has 4 voices, and was last updated by Christina Chester 4 years, 9 months ago. Left curious by the frighteningly scary scarecrow-esque, mannequin-type characters found within the British Pathe footage of Greenwich that Mike shared within the Herstmonceux thread, I thought I’d hunt around to see if there is any more that might be of interest. Well, (perhaps, thankfully) I wasn’t able to find any more of the ‘ROG Scarecrows’ but I did stubble upon some other interesting footage filmed at the ROG. 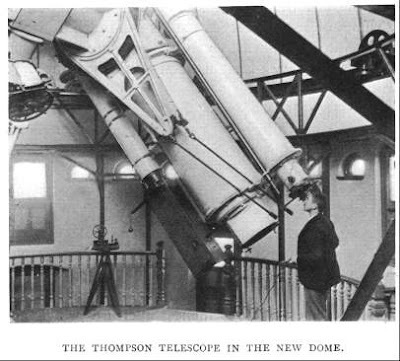 The scope being used at Greenwich is one of the Dallmeyer Photoheliographs, which was situated in the Altazimuth pavilion (that’s the dome you see opening). It may even be the same Dallmeyer that is in there today (it moved to Herstmonceux and then back again to Greenwich), but I can’t be certain as there were 5 made in total (for the 1874 transit of Venus). As for viewing the partial eclipse using film, as the members of the public were… that got me a bit worried!! However, it can be done, but only with black and white film made with a silver emulsion, fully exposed and fully developed. Colour film should never be used. So, it’s quite likely in 1921 that this would be the only film available… unlike today! ..I walked right into that one, didn’t I…. Did wonder what type of film was being given out to the public and how safe it would have been. Very interesting but what about their poor eyes?! Thanks for the historical ‘scope facts. Didn’t know this – also very interesting! Flamsteed sandwich boards at public events, original. We would have to get one for every committee member. Christina, I’d guarantee the film was OK, providing it had been fully exposed and developed. This is only possible with true black and white film (which would have been the type that Pathe would have given out) as the layer of silver within the film that remains after development will protect your eyes. Colour film is different, as it only contains coloured dyes after developing, so wouldn’t protect your eyes. I did wonder why Pathe decided to hand out millions of pieces of film to view the eclipse… I imagine that film was rather expensive. I wonder if it was anything to do with moving to the new “panchromatic” film stock rather than the old “orthochromatic” stock, which was sensitive only to blue and green light. Or perhaps they were just feeling very generous… who knows? Oh come on… everyone knows this, don’t they… DON’T THEY???? No????? Oh gawd…. Ignore the criticism of those who do not know about film they do not know how empty their life is. Also I do not know if you were aware that the big developers used to reclaim the silver left in the chemicals after processing. Not quite sure when that practice was started. Yes, indeed, silver recovery is pretty big business. As far as I know it’s been going for as long as the film has been produced, and is relatively easy to do… it’s just a process of electrolysis. I know that Kodak used to get quite a sizable amount. When I worked in a photographers we used to get a fair amount as well. Right, my fault… I’ve taken this thread seriously off topic. By way of recompense, here is another gem from Pathe News… this time, it’s the visit of King George V and Queen Mary to Greenwich in 1925 , to celebrate 250 years of the Royal Greenwich Observatory. This is great stuff. The first shot is of the South Building (or the New Observatory as it was then called). King and Queen then enter the observatory dome, looking completely bemused. Queen eyes up the (very comfy looking) observers chair (“what on Earth is that for?”… I’m sure she’s saying). The Astronomer Royal (Sir Frank Dyson), then pushes and pulls at the telescope (which must be the Thompson 26-inch Refractor, which we saw yesterday). King looks even more bemused, but then has a go himself… but doesn’t get very far (wouldn’t make much of an astronomer, that fella). Queen exits South Building with Frank Dyson. King follows on talking interminable rubbish. I love these old newsreels! Another interesting piece of Pathe footage! Doesn’t the observers chair resemble a dentist chair a little bit? Looks very comfy! Noticed lots of rope swinging about in the background… Wonder why. Very difficult to recognise that it’s the same place, but note the porthole windows! I think the Endeavour Room is just about my favourite part of ROG. It’s a toss-up between that and the 28″ itself – except that I know how to read a book all by myself but I’d struggle with the 28″!!! That’s so interesting! I love the comparison photos of past and present and agree, it’s difficult to recognise but those porthole windows do give it away. 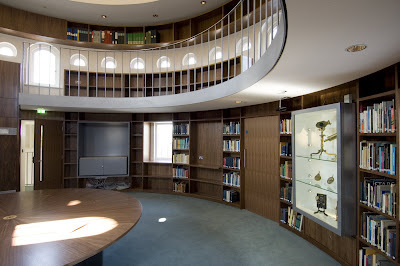 I’ve never seen the Endeavour Room – only in photo form! I imagined it to have looked more like the Great Equatorial dome judging from the video footage. There were windows in there back in the day too if I’m not mistaken. They’ve since been covered up by the poster display cases? Right?